National award double for Vale of Clwyd green energy company | News by Wales Express News, People Before Profit! A Denbighshire renewable energy company has won a prestigious green energy award at a major national awards ceremony for the second year running. Hafod Renewables, from Denbigh, has once again been named Wales’s top Renewable Heating Initiative (RHI) Installer of the Year at the Wales Energy Efficiency Awards in Cardiff. 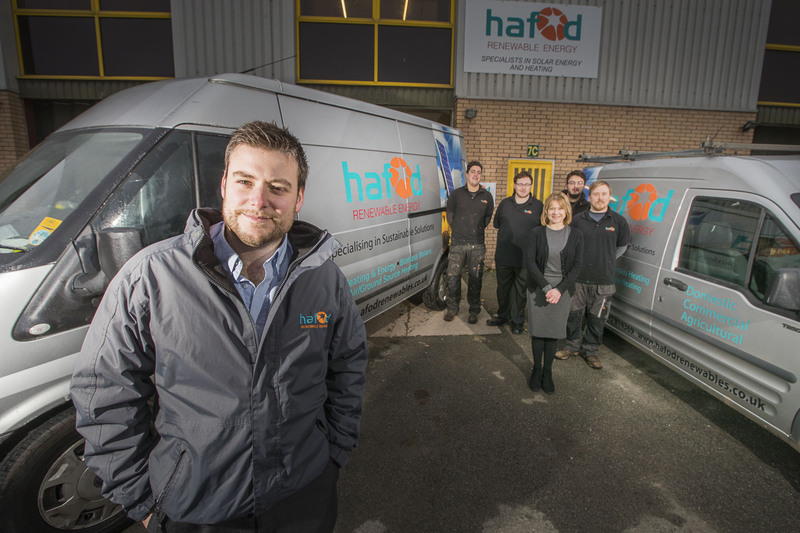 The accolade, which covers air and ground source heating systems, biomass and solar thermal schemes, came at a glittering occasion at the Marriott Hotel in Cardiff when Hafod were also in the top three Solar Installers in Wales. David Jones, Managing Director of Hafod Renewables, said: “We’re delighted to have won this title again and to be the only company to be in the top three in this and the Solar Installer category. “Our speciality lies in being able to find the best renewable energy solutions for our clients and to be able to design and build bespoke systems which are tailored to our clients’ circumstances and requirements. 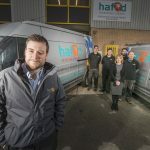 In the past 12 months Hafod, which was founded in 2010 by David, a qualified electrician with a degree in renewable energy, and his father, Richard, a heating engineer, has installed 113 RHI systems worth almost £1 million which have saved 360 tons of carbon dioxide. These have included a £55,000 60-kilowatt ground-source system, big enough to heat five homes, at Derwydd Farm, Llanfihangel GM, for egg farmer Llyr Jones and the same type of system but fed by three 270 foot deep boreholes at Penllyn on the North Wales Wildlife Trust’s Cors Goch National Nature Reserve. Ground-source isn’t always the most practical solution – Hafod used air source heating to warm a draughty old 16th century rectory in Cefnmeiriadog, which had previously relied on less sophisticated renewable heating consisting of open fires and logs and an old oil-fired boiler. They replaced a 40-year-old oil boiler and AGA cooker at a Denbighshire home and stables with a biomass pellet boiler in a central plant room heating connected to a district heating system with weather compensation controls and linked to a Cloud-based app on a smart phone. In the last 12 months they have also retro-fitted ground-source heating to an historic 16th century Grade Two listed Tudor long barn at Caerfallen, near Ruthin, in Denbighshire, air-source heating at North Clwyd Animal Rescue’s kennels near Holywell and air-source heating for a house with its own cave system at Coed y Glyn Uchaf, near Glyn Ceiriog. The business which began in a small shop in Denbigh now occupies a 125 square metre industrial unit on the town’s Colomendy Industrial Estate, employs nine staff and has become a key player in North Wales in renewable energy systems. David said: “It has been a memorable last 12 months because we have seen a big change in the market so that although RHI schemes overtook solar as the major proportion of our work that trend has reversed again recently. “That’s been driven by a rush to solar because the feed-in tariffs came to an end in April but I believe it will continue to be important because solar power can now hold its own against oil, gas and conventional electric competitors. David, whose own home in Trefnant, is virtually off-grid with solar and air-source systems which even power the family’s electric vehicles, added: “We have been successful by being versatile, by being able to design bespoke solutions for clients and by using only our own dedicated teams of installers. “The fact is that it’s necessary to keep up with these and other developments such as wall-mounted solar-powered batteries – if you stand still in this fast-moving industry then you’re finished. “The UK recently saw 30 per cent of its power produced by renewable sources – who would have believed that was possible even five years ago. “In just a few years almost everyone will be driving electric cars and by then that figure of 20 per cent will be dwarfed by the power being produced by solar, wind, tidal and other renewables. Caption: Awards-winners – David Jones, Managing Director of Hafod Renewables and his team. The Snowman Triathlon: Entries for the legendary race are NOW OPEN!